Zubair Sayed is the Head of Communication and Campaigns at CIVICUS, a global alliance of civil society organisations. JOHANNESBURG, Apr 30 2016 (IPS) - Imagine a world without the media, where we have no verified information about what’s going on around us. Where everything is hearsay and gossip, where there are no trusted sources of information. It would be hard to operate in a world like that: to make decisions about what to do about the things that affect our lives. Think for a minute too about what it would mean for those in power; they would be able to act as if we, the people, did not exist. It would be impossible to hold them to account, to know that they’re keeping the election promises they made in their wordy manifestos, and it would be impossible for our voices to be heard. Similarly, it would be difficult to know how companies are behaving, how they are treating their workers and the environment, and whether they are colluding to extract ever more from our pockets. The role of the media in providing credible information, of giving voice to the people and holding those in power to account is fundamental to the realisation of our freedom and human rights. Whilst there are differences of opinion about whether the media are part of civil society, what is undisputed is the key role that they play in social and economic development, democracy, human rights and the pursuit of justice. Organisations and activists that work on social issues and help articulate public opinion need the media to disseminate the voices they represent. Without a plurality of voices, ideas are diminished, debate is stifled and tolerance is weakened. Yet, or perhaps because of their role in giving voice and speaking truth to power, the media are increasingly under attack from both governments and corporate interests. This assault on journalistic freedom takes many forms, including regular harassment of journalists, censorship, confiscation of equipment, closure of media outlets, arrests and in some cases direct and dire attack. Research by the Committee to Protect Journalists is quite chilling: 72 journalists were murdered in 2015 and a further 199 imprisoned. 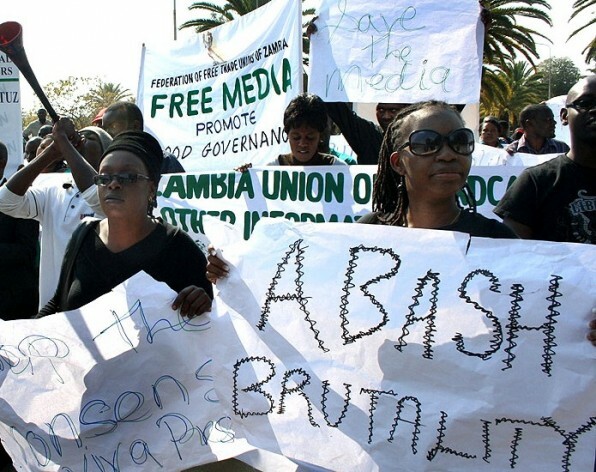 In Africa, the situation for media varies in different countries across the continent. Alongside Eritrea and Ethiopia as two of the most censored countries in the world – in first and fourth place respectively – there are countries like Namibia, Ghana, Cape Verde and South Africa that score highly when it comes to freedom of information (even though those countries too experience challenges to media freedom). However, in far too many African countries the media come under regular attack and freedom of information remains a distant right. The situation for media in Burundi following the violence and repression that started ahead of last year’s election has not improved, and some say that the country has seen the near complete destruction of independent media with journalists and civil society being targeted. Facing shutdowns and direct attacks, many journalists have fled the country out of fear for their lives. Similarly, during the last year in Djibouti and the Republic of Congo, the desire of leaders to hold onto power and to silence voices opposing them, contributed to election-related violence and media repression. Of course, the media don’t only face attack during elections. In Angola, the government has kept a decades-long close watch on the media, frequently arresting and harassing those it disagrees with. Currently, journalist Domingos da Cruz is one of 17 activists in prison for his participation in a private gathering to discuss non-violent strategies for civil disobedience. This attack on the media is itself part of a broader attack on the fundamental freedoms of expression, association and assembly that CIVICUS has been documenting during the last few years (in 2015 there were serious violations of these freedoms in more than 100 countries). Attacks on the media often go hand in hand with those on activists and organisations that challenge or question the powers that be. In many countries, this crackdown happens with impunity and attacks often go unpunished. While governments are the main culprits when it comes curtailing media freedom, the private sector also often seeks to control or manipulate media outputs in ways that favour them and their narrow interests: putting profit before people. This takes place in multiple ways, from the concentration of media ownership and the power that allows corporates to yield, to bribing journalists and influencing editorial content in exchange for paid advertising. Often caught between state repression and corporate influence, media in many African countries face huge challenges. While there is no one-size-fits-all solution to these challenges a key part of the solution must be to support independent media, including citizen-journalism; for regional governance institutions to hold African countries accountable and for African countries to hold each other accountable; and for education and awareness about rights related to freedom of information and expression. With regard to the latter, recent research shows that there is widespread support for media freedom and freedom of expression in Africa but that support for these rights is not universal. In some contexts, journalistic ethics need to be strengthened; media outlets need to invest more in their journalists and support for independent media amongst civil society and the general public needs to be amplified. We need to look towards innovation too, to think of ways to use inexpensive technology to produce people-powered information and data. Given the challenges we face on the continent, the current media crackdown is untenable and dangerous, and does nothing to facilitate the progress so many are working hard to achieve. As citizens of Africa, we need to increase our efforts to protect those that give us voice and help us realise the full scope of our rights.